In all of it’s wide-angle goodness! 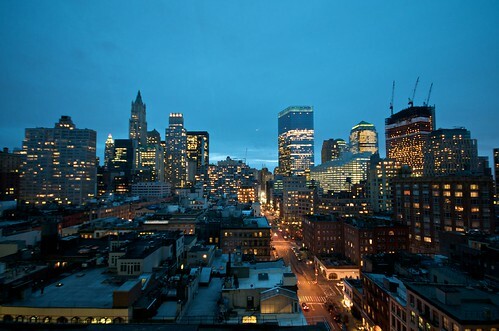 This was the view from my office over at 40 worth st. overlooking West Broadway in Tribeca. We recently moved a little further west into the Bendhim Building at the corner of North Moore and Hudson streets (Right across from Bubby’s). It was an interesting time over there though – the building was mostly occupied by DOT (until they moved over to water street right before us). They were suppose to turn the entire building into condos and then the housing market crashed. Looks like they are still renting office space though. ~ by mrpatrickblog on September 21, 2010. Beautiful blue with a lot of light.